Just look at the Oricom Secure 710 baby monitor. It has everything you can think of to keep a close eye on bub, starting with a large 2.4 inch colour LCD display screen – a feature that was totally futuristic just six short years ago when I had my firstborn. 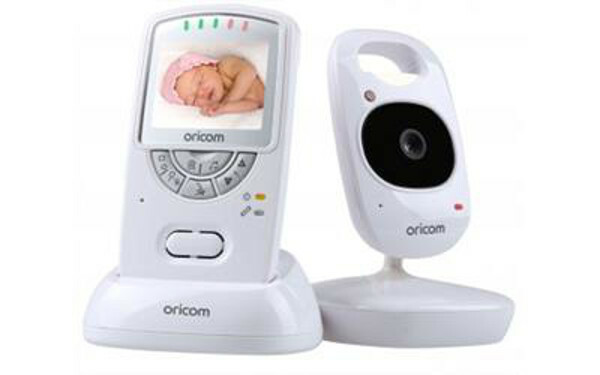 With infrared night vision and temperature monitoring, this is Oricom’s latest premium digital video baby monitor. The infrared camera can easily be mounted on the wall so you can see a clear pic of your snoozing baby even at night. In the way of extras, this baby monitor has it all! There’s a comforting night light and five polyphonic lullabies to chose from. And if that isn’t enough, this monitor has a parent talk back feature so you can sing your very own lullaby from another room. Best of all, you can turn the sound down at night and rely on the sound sensor lights to monitor noise levels in your baby’s nursery. The Oricom SC710 baby monitor costs $199.95 and comes with a three year warranty.